Hi everyone! Welcome to the homeschool curriculum forum post series! Today we’re discussing reading and phonics. Since my children will be in grades prek, 2nd, 4th, and 5th this post will be geared towards elementary students. However feel free to leave a comment for whatever ages you are working with as I know it will help other homeschoolers out there! For the early years I like to stick with basics and use Abeka for phonics and language practice. I prefer the more traditional approach to teaching letter sounds and blends as well as the reinforcing worksheets provided by Abeka. I also like the various readers that come with the program as well as the comprehension questions after each story. You’ll want to make sure to get the “text questions and answers key” for the readers. I also like the “Read & Think” skill sheets that Abeka has starting in grade 3. They are timed reading exercises with comprehension questions at the end. The skill sheets are graded so you can assess how well your student does with comprehension. They also help prepare students for standardized timed testing as well. Uses traditional sound blending for phonics practice. Contains Read & Think Skill Sheets for upper grades. Can be pricey unless purchased used. Comprehension questions aren’t quite as in depth as the comprehension of BJU Press Reading program. What are your favorite Reading/Phonics curriculum, resources, websites, etc? Leave a comment below discussing your choices for this year and why. Feel free to ask questions or reply to each other too! It’s my way of doing a forum without actually doing a forum haha! 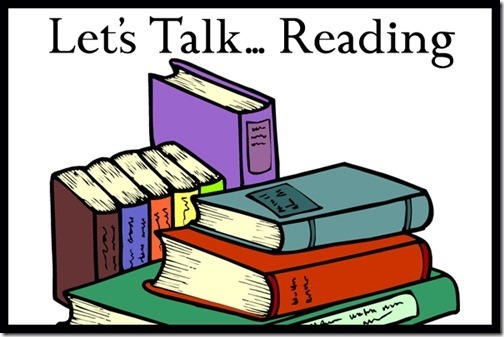 Note: Please keep today’s conversations geared towards Reading & Phonics, I will be posting one for each subject separately so we can keep our comments organized. I have a question about Abeka. How long is the program? Does it take 1 year to teach your child to read or two? And by that I mean you can give him/her any book (within reason) and they will be able to phonetically sound out any word they haven’t seen before. I cannot agree more the Erica here. I don’t even consider it pricey considering the response I get from using the Abeka language arts curriculum. My greatest fear was messing up their phonics and reading. When we began the oldest was already reading but I doubted if I had what it would take to teach a child to read. The youngest is doing great. We have only used the Abeka program and she began with the little Kinder readers that they have. Her word attack skills are great. It makes her a better speller as well. She was reading in the first few weeks but is now flowing through a story with ease. She amazes herself as she reads in public. It is not one of those “teach your child to read in a month” kind of programs but it is solid and lays a solid foundation. The oldest one loves to do the THINK AND READ booklets. She will often ask to do more than one story at a time. As to the question about one or two years: that would depend on the child. If they can handle more than one lesson per day like the youngest then they will be reading most books in a year but if you inch along then the ability to “sound” out the larger words would be more than a year. 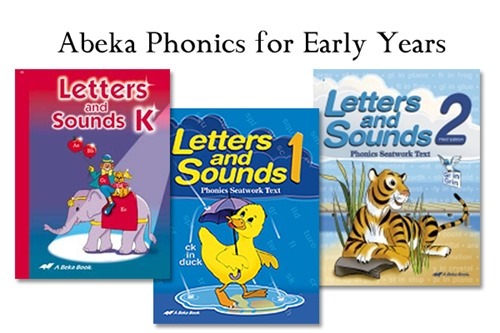 Abeka recognizes so much more than a basic phonics, it approaches ALL the phonetic sounds. Amy S. – My kids are in public school (K and 2nd). I can not stand how they teach our kids to read – it’s all sight words and guessing. Homeschooling isn’t an option so I’m looking for a suppliment we can do at home. 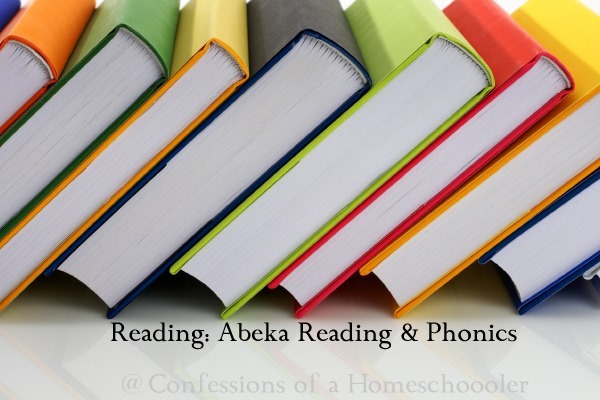 Would you recommend Abeka or hooked on phonics or something else? I don’t want to confuse them with their learning at school but I also don’t think I’m doing them justice or doing my job as their parent by standing on the side lines not doing anything. Any thoughts or suggestions are appreciated!! Reading Eggs might be a good supplement to use. My kids love it. My 5 year old hasn’t started Kindergarten yet, and Loves Reading Eggs. It has helped him start to read before we started a formal program. I agree with the other ladies that Reading Eggs can be fun too (we want reading to be fun! ), but if you’re looking for serious results a comprehensive results for teaching your children to read and build their confidence in the process a good reading program can make all the difference. Jennifer K., did you use the 2nd grade Abeka curriculum or did you start her in the 1st to catch her up? My daughter is not very strong with her reading and i am looking to change her to Abeka. She is going into 2nd and I am not sure where to start her since we are switching curriculum. I bought this for my son, expecting to homeschool, we ended up not after a few months due to a huge loss in our family. BUT, from the time I did spend with it I noticed it needs (or at least I thought it did!) some supplementing. The K teacher at our church’s school agrees with that and says she also thinks it moves to quickly for the average student. This said, though, by Christmas time the kids are moved into reading groups and can read grade appropriate material. As for just giving then ANY book and having them sound out some foreign word…well my 4th grader still needs help with that now and then. I taught my three year old to read in several months using the book “Teach Your Child to Read in 100 Easy Lessons”. It was phenomenal!! She is now six, we are just finishing up Kindergarten, and she is reading proficiently at a grade 3 level. I will be using this for all my kids as they reach the pre-kindergarten age. One of the best parts is that the book is very inexpensive on Amazon, and can be reused! For reading practice this year, we checked out lots of chapter books from the library and used RAZkids online, which is awesome! I used this as well and I loved it! I did this with my son when he was 5 (he’s now 8) and is reading on a 3rd grade level. Once I finished the book, I moved to just having him read out loud to me from library books like Magic Tree House, or anything else that he wanted. I now use the Progeny Press study guides with stories. We are currently doing The Cricket in Times Square with their study guide. Since it’s geared a bit above where he is, we just go at a slower pace. His reading is very good, but our problem is he just doesn’t like to read much. I loved both Teach Your Child to Read in 100 Easy Lessons as well as Progeny Press study guides because you can use them again and again with your other kids. I tried using this to teach my second daughter to read and it just didn’t work. Yes, it’s inexpensive but still a waste of money if it doesn’t work. 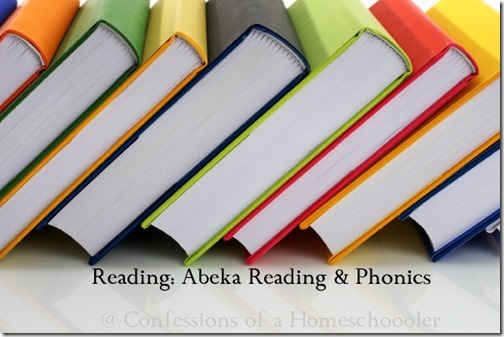 I used Abeka for my oldest daughter and ended up going back to it with my second…she was reading in no time. I have also had several homeschooling friends who used 100 East Lessons and it didn’t work for any of them either. I am glad to read that someone had success with it though. We used this successfully with my DS even though he didnt like any part of it but the stories. Its a great program. My DD however really struggled with it. She is a visual/ kinesthetic learner and has had a tough time learning to read. We set aside 100 Easy Lessons and switched to HOP K. This was a little better but she still struggles and Ive had to use foam letters etc to be as hands on as possible. It taught me that one reading curriculum def doesnt fit all 🙂 We are switching to All about reading 1 for next year….cant wait to use it! I am also using the 100 Easy lessons with my 5 and 3 year olds. My 5 year old is doing great with it (could be the age) but my 3 year old struggles a little. I combine the sounds with the “Jolly Phonics” hand motions. By doing this, they remember the sounds much better. We have only been doing it a little while and are only on Lesson 23, but I am hoping that by the time next school year comes around, the oldest will at least be reading. Note: He turned 5 in November, so he is not actually in K yet, but I am hoping that since he has an older sister, I can quickly push him through K and on to 1st grade. 🙂 We also go to the library and get the beginner reading books. I was recommend this book also (Teach Your Child…) from three different homeschool moms. I bought it for my son who had just turned 4 and I was amazed at how easy it really was. We try to do a lesson a day although we probably end up doing 3-4 a week in reality. The lesson we are on is 80 something so about 20 left and he has started reading those level 1 and 2 beginner readers. Each week we go to the library he picks out 4 or 5 and he reads to me. He gets so excited when he sees he’s read the whole book by himself. When we were still in the phonics stage my daughter responded very well to Explode the Code. It must have worked because going into 6th grade next year she is an amazing speller and reads all the time. For reading we stopped the “readers” after about 3rd grade and started reading everything. Classics to just for fun to popular. I always read a book ahead of her and would have her journal and notebook about the book she was reading. The fun thing about the notebooking is we include so many different projects related to the book. We have been using Sing, Spell, Read & Write this year (kindergarten) and she’d loved it. It comes with a cd she loves to listen to. It’s very engaging. The only problem is, my dtr isn’t great at handwriting and doesn’t enjoy coloring all that much. But they get to keep track of their progress and race around a track. Seems it could be updated a bit (has cassette tapes and an instructional VHS tape), but it’s worked for us. Would love to supplement, though. I’ll buy the book from Amazon mentioned above, but does anyone have suggestions for learning the rules of this crazy language at a first grade level? We used sing spell read and write also, and my first grader was reading on a third grade level before we even finished the program. My kids love the games and songs too. We use the 1st grade level Sing, Spell, Read and Write curriculum for my 1st grader and it is perfect. If you liked the kindergarten level, then it would be an easy move on to the 1st grade level. There are great 1st grade songs, race track, phonics games, treasure box and 17 readers. Doesn’t have any coloring except for the handwriting/phonics review (we skipped over that). Definitely perfect for a 1st grader. Just keep a good pace because the important spelling rules don’t come in until around lesson 14 (36 total lessons). My daughter loves it! Such a great phonics and reading program. We absolutely loved Level 1, and now we are almost finished with Level 2. I used “Teach Your Child to Read in 100 lessons” with DD#1, and it was great for her. With DD#2, it was just not a good fit. The odd way the letters were written just confused her. AAR has been exactly what we need. I second that Dion, we LOVE All About Reading!! We tried The Reading Lesson, Teaching Your Child to Read in 20 Easy Lessons for a little over half the year and my son struggled everyday. We finally decided to try something else and I can’t believe what a turnaround he has made. He has done better in 2 weeks than he did the whole first half of the school year! All About Reading is entertaining and engaging. I would recommend this to anyone! We LOVE All About Reading. It will be the perfect complementary match to use with All About Spelling. We use All About Spelling for my oldest. When teaching my second to read, it occured to me how simple spelling would become if she learned to read using the same phonograms. My K-5 sweetie is picking up reading so easily using All About Spelling. We had previously purchased Teach Your Child to Read in 100 Easy Lessons, but after a few days into it, it was just not our fit. We taught our oldest to read using My Father’s World. It worked, and she is an excellent reader, but All About Reading is much better in my opinion. We have used Abeka’s Animal Alphabet Friends to learn the letter sounds during pre-k years (2-4). I will be adding the All About Reading Pre-Reading program for my 4yr old next year. So excited about that. How have you taught the AAR pre-k with your older child’s AAR? I have a Kinder and a PreK this year and I’d like to use AAR with both of them! Do I need to purchase both packages? I use my LOTW for prek, so I didn’t use AAR prek but it mainly teaches letter recognition and sounds like a normal prek would. Then the AAR L1 moves into reading, slowly, but they’ll want to know their sounds before doing AAR L1. My first two kids were reading fluently by 4…not because I taught them anything, but they just picked up on reading quickly. My son is now 8 and reading at a High School level. Then child 3 turned 5 and still didn’t know all her letter (not for lack of teaching). We tried 100 easy lessons, Phonics Pathways, Hooked on Phonics, but we’ve settled on AAR right now. We are almost done with the Pre-Reader Level, and she loves it! She participates in her older sibling’s school, so she enjoys that the crafts and activities are just for her. Also, the customer service just can’t be beat! My second grade daughter really struggles with reading. We started with Teach your child to Read with little success, moved to HOP, still not much success. We have used Memoria Press Phonics book, and continue to do so. She is reading chapter books, but still has some trouble. Ive thought about All About Reading, but am wondering where to start at. Because she is reading, just not fluently? Any suggestions? The Adventures in Phonics Workbooks are fabulous. They have level A,B, and C to start using in Kindergarten. They are less than $8 each and a child will have a complete understanding of phonics by the time they are done. My 4 year old taught herself to read by asking me to help her do this workbook. I have used it for 4 of my kids, and it delivers results. YOu can order it at Christianbook.com or Amazon. Adventures in phonics is wonderful. I would say it is also a traditional way of learning phonics. I am finishing up level A and moving to level B and so far my daughter has been doing the worksheets on her own without much help. She also has taught herself how to read. You can also buy it at christianlibertypress.com. I used All About Reading with my Kindergartener for a few months, but the Kindergarten level, in my opinion, is more suited for Pre-School aged kids. So, we just review our letter sounds, sight word flash cards, and do the activities on http://www.starfall.com You don’t have to, but I purchased the year subscription to access all the activities on the site. My toddler likes to sit with her while she does the activities and he also likes to go through the letter sounds activities on his own. We really love that site. For first grade, we’re going back to AAR Level 1 combined with All About Spelling Level 1 since there is the daily phonetic sounds review for both curriculums that we can do at the same time. We also read whatever book she wants to read, I let her pick her own books at the library. I read a sentence and then she’ll repeat my sentence. I also will stop as I’m reading a sentence and point to a word I know she knows. Lots of praise and excitement on my part when she is able to read a word or sentence fluently. I’d also like to piggyback on her reading stories with me to include that we stop at the end of each page and I’ll aske her questions about why certain things happened or what does she think is going to happen. I’ll even ask her what she would do and things like that. Her comprehension has grown so much over this past year just by us doing that. My oldest is in the fourth grade with an eight grade reading level. He was born with a book in his hand, LOL. Not really but he has been reading huge books since he was in the second grade. He has always had strong language skills and picked up reading so quickly that I don’t even know what did it for him. I’ve never done readers though, just let them pick out their own books at the library. Just wanted to let you know that AAR 1 and AAS 1 were a little redundant for my kids. I started them at the same time and soon realized that the spelling program could wait. We are just finishing Level 1 of AAR and I plan on starting AAS 1 when we start AAR 2 (I think the website also suggests that). They do suggest that,which is why we won’t start AAS Level 1 until 1st grade. Also, in response to Ronnie, the AAR pre-reading level is geared toward pre-k. That’s probably why it seemed too easy for your preschooler. We are using AAR Level 1 in kindergarten, which any child that can recognize the letters and knows the sounds of the letters should be able to handle. I have a kinder who is reading cvc words fairly easy and who’s fluency is steadily improving he knows some sight words. Was in public school but is now homeschooled. No formal phonics curriculum in school outside of letter sounds. He knows NO blends. Thought about ordering AAR level 1. Any feedback from anyone would be helpful! I feel I should go back even though he is reading and teach a solid phonics foundation. Help this first time homeschooling mom please! For reading I love, love, love Christian Light’s, Reading to Learn Series. The stories are so wholesome and Biblical. I use the workbooks, but skip their phonics. I just buy the hardbound readers and workbooks, but not the teacher’s manual. For phonics I love All About Spelling and Explode the Code. We use Victory Drill Book to build speed. To teach a child to read I use lessons from the website Hubbard’s Cupboard and the book, The Reading Lesson. If you have a child in 4th grade who loves to read I recommend the Moody Series from Titus 2. com. They are written by a homeschool graduate. They do incorporate their own personal standards and talk of pregnancy and mom having a baby at home, but the examples of the family serving Jesus and witnessing have been great for me and my kids. Also, the siblings have great relationships. They don’t call each other names and they apologize to each other when they are wrong. I’ve seen positive fruit from the books in my kid’s lives. I also use Christian Light’s Learning To Read and Reading To Learn curriculum. My kids love the stories and actually cried when I considered switiching to another reading program. The stories also teach Christian values. I am starting LTR this year with our 4th child. Each child is different but all did very well and are confident readers. I would say if you decide not to use the L. Arts find a spelling program to use. Adventures in Phonics by Christian Liberty Press. There is Level A, B and C. In addition with Level A is 4 readers. It is very cost effective. You can also buy the Student and teacher book and readers as e-format through Currclick. Just love the program and kids love it too. My oldest, now 7, pretty much taught herself how to read and began reading just before we turned 4 after we got through the basic CVC words. We used the Ordinary Parent’s Guide to Teaching Reading. It was boring, but effective! She can now read 5th grade level books, and so we skipped through most of the “readers.” We used Bob Books. also like how the font looks normal in OPG; font in some other programs confused ME :). We began All About Spelling and have now switched to Rod and Staff Spelling. For my second daughter, just 4, I am considering All About Reading. She likes workbook-type stuff better, and I need the organization of a “letter of the week” curriculum (thanks Erica I have been using your Letter of the Week” too!) I’d love more feedback on All about Reading. I’m halfway through A Beka K5 and my son is doing fine. But it just seems so dry to me. Did things really liven up when you switched to AAR? Do you think it is just as sound an education, phonetically? Yes, AAR is much more hands on and fun for them I think 🙂 Abeka is more geared towards classrooms so most of the material is meant for seatwork. I have to agree with Mary Ann about the Ordinary Parent’s Guide (OPG). It’s cheap, boring, and effective. With my daughter, I used it as an outline for a homemade phonics program, making flip books, etc. using the words in the lessons as we went through them. That made it less boring. With my youngest, I got lucky. He has a very orderly, mathematical/engineering brain. He didn’t find it boring until we had gotten through a significant amount of the material. He hasn’t started kindergarten yet, but reads anything that interests him, which is mostly picture books, nonfiction, and recipes. He can also read most of the words in his assigned scripture verses. I am using OPG and letter of the week with my 3 year old. It doesn’t have to be boring. He likes the little poems and I always play games with him and he can work independently with most of the LOTW. He’s not quite reading yet because we are still working on vowels. I started in February. We read lots of book from the library too.